To make the cookie “hamburger buns,” heat the oven to 375°. Use an electric mixer to cream the margarine and the sugar until fluffy (about 1 to 2 minutes). Add 2 eggs and beat well. Stir in the vanilla extract. Sift the flour, baking powder, and salt into a separate bowl. Then, add the dry ingredients to the creamed mixture and blend well. For large “buns,” drop the dough by rounded tablespoons onto a lightly greased baking sheet at least 1 inch apart (for medium-size buns, drop the dough by rounded teaspoons). Next, use the bottom of a floured glass to lightly press the dough into a circle. Then beat the remaining egg and use a pastry brush to “paint” it on top of each cookie. Sprinkle sesame seeds on the tops. Bake the large cookies for 10 minutes and the medium ones for 8 minutes, or until the cookies are golden brown. While the cookies are cooling on a rack, make the “lettuce.” Place the shredded coconut into a plastic bag. Add a few drops of green food coloring, close the bag, and shake until the coconut has turned a light green. To assemble the burgers, choose two cookies that are about the same size and shape. Spread icing ketchup or mustard on the bottom bun, add an appropriately sized peppermint patty, and sprinkle with coconut lettuce. Add a squirt of icing ketchup or mustard to hold the top bun in place. Arrange the hamburgers on a platter or wrap in foil. Makes approximately 12 large or 36 medium burgers. I just joined Relish.com. I was spectacle as to how great their recipes would. When I logged on and looked through my recipe options there were actually several I wanted to try (surprise, because I am SUPER picky.) I cooked my first two recipes this weekend, and they were delicious! Relish is my new best friend. You pick your recipes, it generates a shopping list for you and voila! Super easy, believe me if I can do it anybody can! Check out my first Relish menu by clicking here Relish Meals. Trying to think outside the traditional valentines day card? These arrows are the cutest, and a fun way to switch things up this year. Again, foung on my fav site designsponge follow the link for instructions! STEP 1: Unscrew a plastic 10-inch embroidery hoop ($2.99;joann.com) so that it opens; discard the inner ring. STEP 2: Slide two 44-inch-wide rod-pocket curtain panels onto the hoop and screw it back together. Or sew your own curtains, as we did, from awning fabric ($30 per yard; sunbrella.com for stores). Either way, the panels should be at least 96 inches long. STEP 3: Take two 24-inch lengths of half-inch-wide ribbon and tie one end of each (with a double knot) onto the hoop at the gaps between the curtains. STEP 4: Tie the ribbons’ loose ends together in a bow. STEP 5: Screw a pot-rack hook ($5.99; potracksgalore.com) into your ceiling. STEP 6: Slip the center of the bow over the hook to hang. I was surfing the blogsphere and came across ashleyannphotography.com » Under the Sycamore she had posted this fun project. It would make the perfect personal, thoughtful gift so I am sharing it with you! Marie is happy to do custom orders for those that prefer buying over making! * VELLUM – I buy this in packs of 20 (I think) in the scrapbooking section of Hobby Lobby. 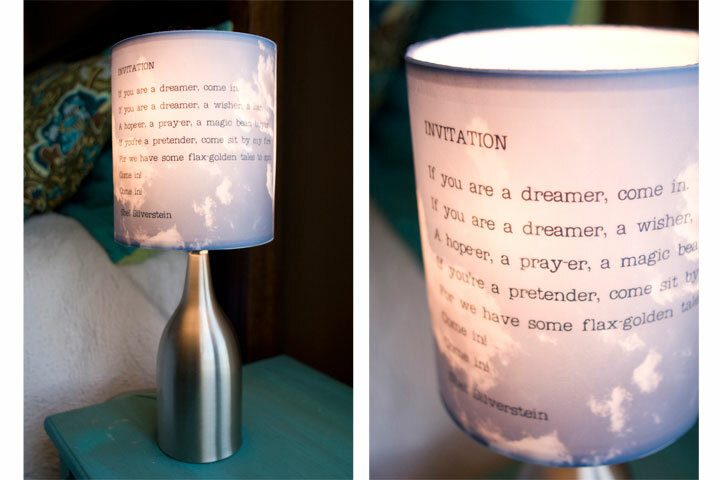 I used clear vellum – but you could also buy tinted vellum for a different look. * CRAFT KNIFE OR SCISSORS, PENCIL & RULER – to trim the vellum, I used a ruler and pencil to mark the cut lines & then used a craft knife and self-healing mat to cut the vellum. Scissors and a steady hand work too. * PHOTOS – I used a free program called Picasa to make the photo collage (I believe this program is made by Google, check their page of programs if you are interested). I used Picnik (a free online photo editing program) to make the different colored photos for the tall lamp. * PRINTER – I have a color inkjet printer. I believe you can also print on vellum with a laser printer. I didn’t take any photos of the lampshade-in-progress because I had no idea that I would ever enter it into a competition or need to explain to anyone how to make it – but I’ll do my best to explain the steps involved. If you are using photos – there are several options. You wouldn’t have to do a collage. You could do several large photos. 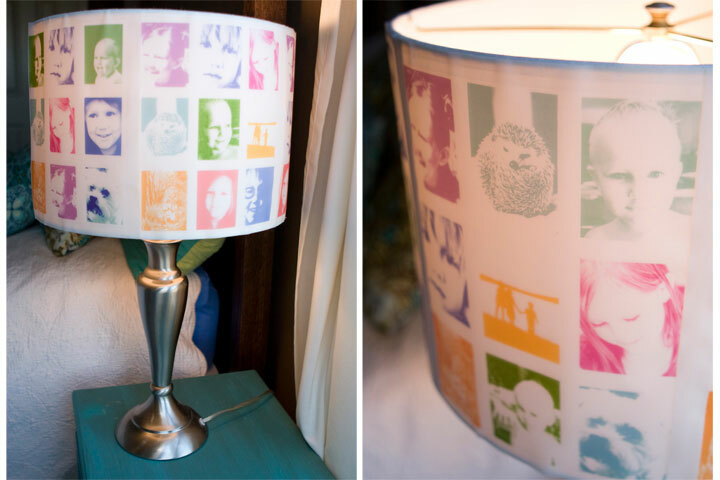 You could make your own collage by cutting out smaller pictures and gluing them individually around the lampshade. You could print them in regular color or black & white or sepia or whatever you come up with! This summer I was playing around with some vacation pictures one day & decided to make a photo collage in Picasa – it’s very easy to do. Just select the photos you want to use, click on the COLLAGE button at the bottom of the page & then format the collage (you can rearrange pictures and choose from different collage options). After I had a collage I liked I decided to print one on vellum just to see if the idea I had might work. 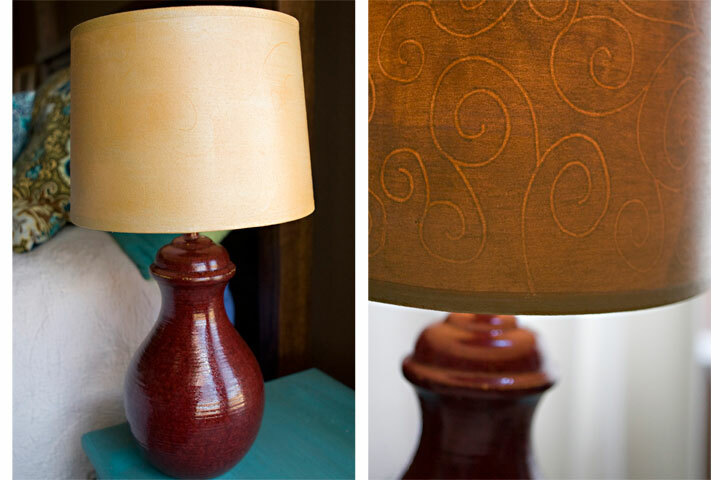 At this point – measure your lamp & determine if you need to change the margins of the collage or photo. My lamp was 10” tall – so I made sure that there was ~3/4” white edge on the top and bottom of the page (8 ½ x 11”) so I wouldn’t have to trim to close to the photos. You’ll also need to measure around the lamp & determine how many pages you will need & if it ends up not being a nice, even number – adjust the margins on the sides to make each page narrower. Next I printed the collage on the vellum – depending on your printer, you might want to adjust the printer settings. In the past, when I printed baby photos on vellum for birth announcements, I changed the setting to “fast” because the “high quality” setting put down too much ink and made it look blotchy in spots. I have a different printer now & I believe I printed this in the “regular” setting – although I’m not certain. Key here – make sure you have plenty of vellum to experiment with. Once the photo or collage or quote (or whatever you decide to work with) is printed, don’t mess with it for a few minutes. The ink takes longer to dry on the vellum and it will smear if handled too early. Once the ink is dry, use your ruler and a light pencil line to mark where you need to trim the paper (if necessary). I have a self-healing mat & craft knife (purchased at Walmart) that I used to trim the vellum. On a smaller lamp I made, I just trimmed the vellum using scissors. Works just as well. Once the pages are trimmed, make sure they fit around the lamp the way you want them to. On the tall lamp I made, I had to tweak some of the edges because the lamp was a tiny bit bigger at the top than at the bottom (didn’t realize this until I was getting ready to glue the pages on & the edges weren’t matching up!). For the black & white lamp – I used a hot glue gun because that was what I had handy. Like I said in the supply list – there are many other glues that would probably work. I liked the hot glue gun because you really can’t see the glue dots unless you look closely & it holds the vellum really well. I used teensy, tiny dots of hot glue on each corner & middle of the side edges – primarily because I wanted to be able to remove the pages at some point to do a different collage. If you want it really stuck down, do a thin line on the edges. I tried a repositionable scrapbooking tape, but the edges kept trying to pull away & I had to touch it up with hot glue. A stronger tape would probably work better & would make for a nice, clean finish (I’m guessing, lol). I’m guessing that spray adhesive would probably work great too – although I haven’t tried it yet. **Two important notes on the vellum (in case you’ve never worked with it before). Be careful not to bend it – because the vellum will crease & once it creases, a line will always be visible in that spot (this is the main reason I cut it with a craft knife – the less you have to handle it, the less chance of creasing it). Second thing to keep in mind – if the vellum is printed with and inkjet printer & the vellum ever gets wet – it will most likely smear. 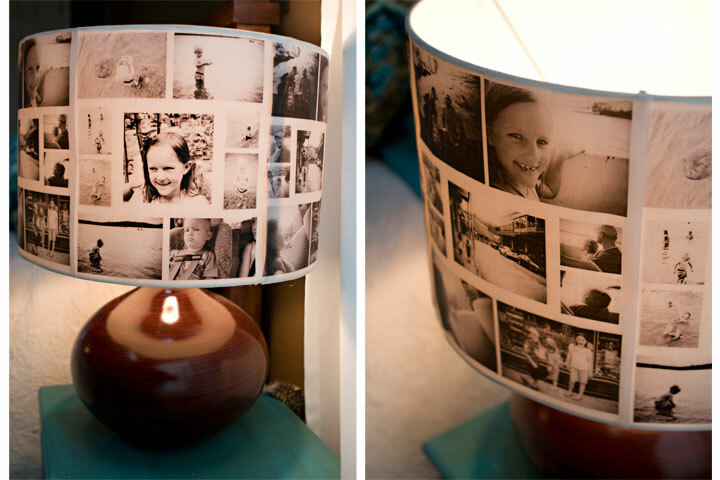 (If I were making a lamp for a bathroom or kitchen or something, I would either glue a second sheet of vellum over the photos or I would experiment with putting the vellum *inside* the lampshade). I hope you enjoy making the lamps and the lamps bring you joy! I made these little insterts for my Christmas cards. I printed them on Avery postcard/ index cards. Feel free to use them too! Click on the link below for a template to print 4 per page and for Avery postcards. CLICK ON POST TO VIEW MORE IMAGES!